My family and I love Mexican food! We love, love, love it and usually eat it in some form or another at least two times a week. I’m always looking for new ways to eat our favorite flavors. So as I was thinking about all the flavors we love to eat in a burrito, it hit me. Why not meld all of those foods into a hearty casserole and have fewer dishes to clean up at the end of the night? Everyone’s dream, right??? If you’re a vegetarian, or you are just trying to stretch your grocery budget even further, you could replace the chicken for another can of black beans, or even a can of pinto beans. If you’re not eating the THM way you could add some frozen or canned corn as well. My family gobbled this casserole up without anyone whining. That’s a true win for this momma! My kids already asked if we could have it again next week. 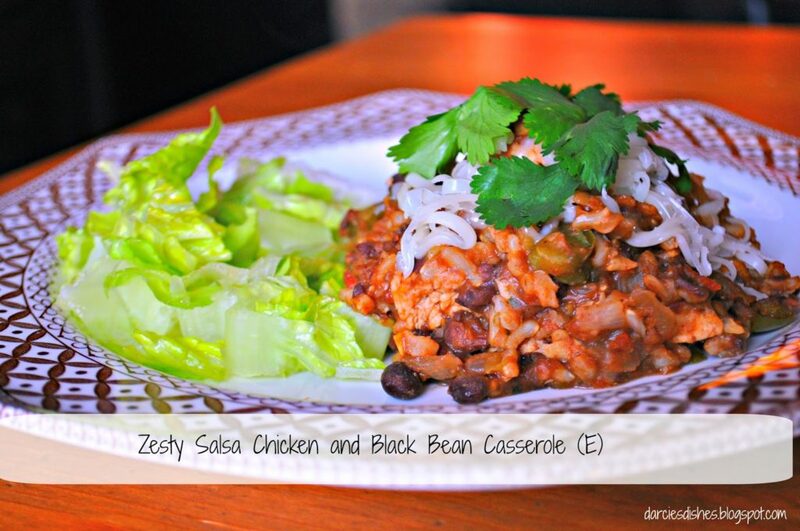 To make this Zesty Salsa Chicken and Black Bean Casserole start by bringing the water to boil in a small saucepan, add the rice, return to a boil and put the cover on. Turn down to a low simmer and cook until tender, about 40 minutes. Next, preheat your oven to 350 degrees and lightly grease a 9×13 pan. Heat the olive oil in a skillet over medium heat. Add the onion, green peppers, carrots and green chilies to the pan and sauté until the onion is tender. Then add the chicken and the spices to the pan. Stir to combine. Turn off the heat and add the cooked rice, salsa and beans to the mixture. Stir and make sure it is completely combined. Adjust the seasonings if needed. Place mixture in the greased 9×13 pan. Bake uncovered for 30 minutes. Serve and top with just a pinch of mozzarella cheese. Some other great toppings are green onions, cilantro, 0% plain Greek yogurt or pickled jalapenos. Mix rice and stock in a pot, cover and bring to a boil. Turn down to a low simmer and cook until tender, about 40 minutes. Pre-heat oven to 350 degrees and lightly grease a 9x13 pan. Heat olive oil in a skillet over medium heat. Add onion, green peppers, carrots and green chilies to the pan and sauté until the onion is tender. Add the chicken and the spices. Stir to combine. Turn off the heat and add the cooked rice, salsa and beans to the mixture. Stir and make sure it is completely combined. Adjust seasoning if needed. Place mixture in the greased 9x13 pan. Bake uncovered for 30 minutes. Serve and top with just a pinch of mozzarella cheese. Hey Darcie do you have an email newsletter yet? Not specifically a newsletter, but you can sign up to receive an email each time I post something new. To do so, on a computer go to the right hand side of my blog and under my thm affiliate link there is a white box that says to enter your email. Thanks! Can I make this in my crockpot? I'm sure you could. I've never tried it before. Probably 6-8 hours on low or 3-4 on high would be enough. Just make sure your rice is getting done. Can you substitute the brown rice with quinoa without changing it from being an E. I'm new to THM so not sure if that would be too much of a change. Thanks. I always mix it in as you combine everything just before baking. I will add it into the directions. Thanks! Yipee…I have everything for this recipe. I had just cooked my brown rice and was looking for an E recipe using the rice. 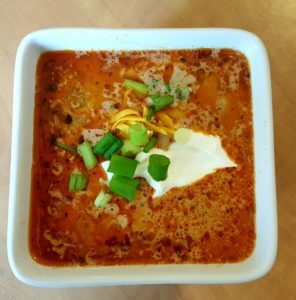 This looks like it will hit the spot….my spicy spot! Thanks, Darcie. What King of meals should I eat to loose weight? You need to alternate between S, E and FP. I eat mostly S meals and try to have 4-11 E or FP a week. Can you freeze this and serve later? Yes, it should reheat fine. I have started working my way through your E meals in an effort to get my guys to eat more beans and "rice" this summer. I have to say, even the picky 15yo who doesn't like spicy food has been inhaling most of these. And you're right, it's hard to mix it up when you like the spicy stuff but are limited to what you can put in it. Thanks! I am looking forward to making some of these up for freezer meals for my hubs for work this fall/winter too! Hi! 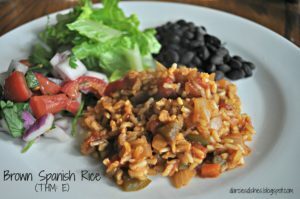 I'd love to make this in my crockpot, when would you add the rice? Would you add everything at once and cook until done? Can't wait to try this. Also, I made the salsa tonight and it was awesome! 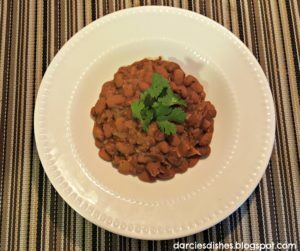 I used a can of fire roasted tomatoes – delish! Thanks! I would add everything all at once. Rice takes a long time to cook in the a crock pot. 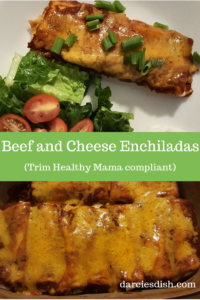 This recipe was a hit in my home! There is just two of us, so I broke this recipe in half and it was the perfect amount! My boyfriend gave me the biggest compliment ever but getting seconds and cleaning his plate clean! That's a home run in this household. Thanks so much for this tasty, healthy dish!